Joel Antonie advocates for refugees, with a focus on those the world has forgotten. With the plight of refugees in the news, Webster University alumnus Joel Antonie reminds people watching the crisis from afar that every refugee has a story. He knows. He works with them every day. 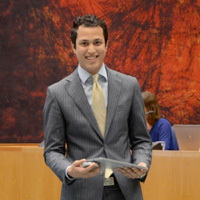 Antonie, who graduated from Webster's campus in Leiden, the Netherlands, works in refugee status determination for the country's Immigration and Naturalization Service (IND), interviewing asylum seekers, writing decisions and training others. In his work, he sees the individual stories that seldom make the news. "In the news, you hear about asylum seekers and refugees and it’s always talked about in numbers. When they do share a personal story, they pick out stories where something isn’t right. It makes it sound like there are a lot of bad refugees. "However, when you interview them, you find out that each person has a story. Some have lost their kids, some have had their parents kidnapped, and one has a brother who is missing. Pretty much everyone has something." "We actually discuss a lot of things that I learned from Webster University, especially from my favorite professors, Anne de Graaf and Peter van Krieken. I also discuss the difference between how you can use your voice instead of violence. "The work that I’ve ended up doing is dealing with the people who don’t get the majority of the attention, the people who the world has forgotten about: who die in refugee camps during the winter or who live in refugee camps for twenty years with no outside attention while everyone else goes about playing, having fun, getting the newest iPhone. "When I came to Webster, I had no idea which field of international affairs I was interested in. It was during my second semester when I met Peter van Krieken. In international law class, he taught with such energy and drive. The way that he could talk about international law and migration got me really interested in this field." Read the full profile with Antonie here [pdf].